Batteries. After finding that it was almost impossible to get gel cell batteries in the Western Caribbean, we opted to change to Trojan T105 wet cell 6 volt batteries. Unfortunately they cost about twice as much as in the US, but at least they were available. Here Greg from Lagoon Marina in LaCeiba helps David jerryrig a pulley system to get the huge gels off the boat. Turned out we replaced the Trojan T-105's again 2 years later in 2009 in Colon Panama because once again, they didn't seem to be holding a charge. OOPS! After getting back to the US and having an electrician friend diagnose the situation, we're pretty sure it wasn't the batteries at all, it was the TruCharge 40 charger! It was perphially involved in a lightning strike in the Rio in 2006. We assumed it was OK, but after it was replaced, we found that it was probably the problem. So before you assume your batteries are bad, be sure to check the charging system! Smart Regulator and Alternator. We replaced the Smart Regulator after lightning struck nearby in the Rio Dulce. Luckily we had a spare aboard because we couldn't have gotten one in Guatemala! We've now replaced the alternator twice - we had a spare - and after we replaced it the first time, we had the old one rebuilt in Colon, Panama, so we always keep an extra! Good thing too because it would not have been easy to get one where we were cruising. Islands 44 Purple That Will Turn WHITE??? Bottom Paint. The bottom line is, you may not be able to get the paint you're used to once you leave the US. Maybe it will be better, maybe not, but it may be different! We had the bottom painted twice, once in LaCeiba Shipyard, Honduras and once in Shelter Bay Marina, Panama. Before this photo, Winterlude had WHITE bottom paint which I dearly loved. Unfortunately there was no such thing available in Honduras, so for the next 3 years, Winterlude had black bottom paint which did not complement the dark dark green hull! Oh well, such is life cruising. When we redid bottom paint in Shelter Bay Marina, Panama, we had somewhat more options, but still no true white. Islands 44 made a paint that claimed it went on purple and turned white once it was in the water. Hmmmm... and if it didn't, Winterlude would have a purple bottom and a dark dark green hull -- sounds even less appealing than black and dark green! But we did it, the shipyard staff thought it was very very funny ... and while it didn't turn exactly white in the water, it did turn a very pleasing shade of light silver. Winterlude is much happier these days, although we'll need bottom paint again after the 2010-2011 cruising season. Blisters. Unfortunately, when we yanked the boat at LaCeiba to get the transmission fixed and new bottom paint, we discovered that for the first time ever, Winterlude had blisters. We're convinced it has to do with leaving the boat in the Rio Dulce, fresh HOT water, for the summer. The fiberglass expert at LaCeiba told us he sees lots of boats that have never had blisters emerge from the RIo with blisters. If we had it to do over again, we would have gotten the boat barrier coated before we left Florida. We talked about it, but decided against it since the boat was 20 years old and had never developed blisters. Transmission. We scheduled this trip to the boatyard because our transmission was leaking badly. 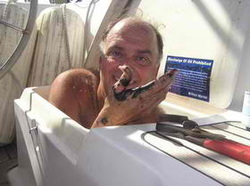 Turned out to be faulty seals which the LaCeiba Boatyard mechanic was able to replace. 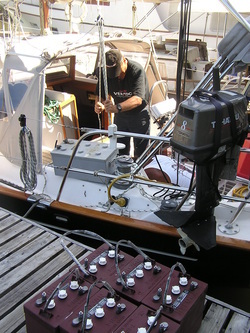 While in the yard, we had numerous other maintenance items done, including replacing the mainsheet and main halyard stoppers under the dodger. Safety Bars. After being robbed in Utila, Bay Islands, we had special stainless steel safety bars fabricated and installed in the Rio Dulce. We wanted these bars before we left the US, but the fabricator that constructed our arch refused the project saying we'd be more likely to be caught inside during a fire unable to escape than be robbed. Unfortunately we left one hatch open and violated our own rule about being off the boat close to dark in Utila. Came back to the boat after dinner about 7:30 PM. When I unlocked the companionway, I thought, did I put the laptop away? Nope, someone came in through the hatch you see above our bed. Stole alot of our electronics, especially the laptop, cameras, video camera, cell phones, etc. So when we returned to the Rio, we had these bars custom fabricated. They snap out easily in case of fire from the inside and we do a "fire drill" with them as part of our once a month maintenance routine. Dinghy. We replaced our old patched roll-up 8' Caribe dinghy with a 9' AB Aluminum RIB. Both dinghies used our trusty Tohatsu 8 HP outboard. The new RIB planes easier and allows us a wider range of snorkeling and fishing areas. We ordered the AB through Marine Warehouse in Miami and had it shipped to Roatan. Despite what they claim, Roatan in 2007 was not a duty free port -- or maybe it was just bakeesh, regardless, we had to pay some ridiculous charges to "import" the dinghy despite it been clearly marked for "Winterlude, Yacht In Transit". We were headed to Panama a month later, so we should not have been charged. We could SEE our dinghy in the back of the shipping warehouse, but for several days we had to either agree to pay almost as much as the dinghy cost OR say no and walk away. We eventually negotiated somewhere around a $200-ish duty and finally got our dinghy. It was stressful, David wanted to say forget it and walk away. After all our old dinghy still worked, we just wanted a faster dryer family car. But all things work out for the best and we love the AB Aluminum RIB. Look closely, the dodger is off getting restitched! Dodger & Bimini. In the 6 years we were gone, we replaced the dodger and bimini each one time. We replaced the white plastic zippers it seemed like annually - they just don't hold up in the tropics. The thread is always an issue as well. Shadetree Awnings. We love our Shadetree Awnings. We had them restitched once in the Rio Dulce and replaced the far forward tentpole twice because it breaks under the harder bend required all the way forward. One of the 2010 refit projects is to get our cockpit enclosure completely redone -- the original cockpit enclosure was designed before we added the arch. As a result, the isenglass windows and bug screening never fit exactly right. We hope to get a new enclosure that will keep the bugs out while we're anchored in the Little Shark River this winter, as well as use the isenglass to provide the "greenhouse" allowing us to use the cockpit as our family room in the cooler Florida winter weather. Autopilot. We left the US with a wheel pilot, Autohelm ST4000 and the wonderful Monitor Windvane. The windvane steers most of the time, even while we're motorsailing. But the ST4000 was undersized for our boat to begin with and it could not handle anything larger than the calmest waves. We left the US with a spare ST4000 since we knew it was a weak link. In Bocas Del Toro, Panama, we added a below-decks autopilot. It's powerful, steering through waves the old autopilot would never tackle. It's also extremely noisy which is the downside. We left the ST4000 in place although it's been replaced by the newer unit when the old one gave up. We use the ST4000 in harbors or calm seas and use the Northstar Autopilot in all other situations where the Monitor windvane can't steer. Changing the oil in Winterlude has always been an exercise in frustration. There's not enough clearance under the engine to get anything attached and we've tried everything from the vacuum cans that slip down the dipstick hole to an electric Stearns pump, to an attachment for a drill. This will be one of the projects we tackle during our mini "refit" to see if there's any way to make this task easier and less grubby! OTHER ... Every year, we do season end maintenance and season beginning maintenance, plus monthly maintenance chores. And, of course, the definition of cruising is "fixing your boat in exotic locales" and we've certainly done our share of that! The cruising community is great though, anytime we ask for help on the next traumatic issue, someone is always there. We return the favor as much as we can because our cruising friends have been so good to us technologically challenged commuter cruisers! I'm sure this doesn't chronicle every maintenance issue we had while we were gone, but it gives you an idea of the major projects!